Get vouchers for material. Do good. so I was seriously considering buying Simplify3D last year. Custom infills, processes, gcode preview - it all looks good. Of course nothing other than AutoMaker took advantage of needle valves. Do we have alternative fully-featured slicer today? Cura 3+ integration is close. I don't use S3D at all but from watching opinion in the facebook general 3D print groups (hilarious at times, mostly infuriating) it seems current Cura tools are preferable or at least comparable when users have both systems. Visualisation tools are also planned for this release. They are pretty nice. We do not currently intend to support other slicers. Is there an update on when a new version of Automaker will be released? The information in the manual is different than the features presently available - I am assuming that these are features that were taken away at some point. Infill is very limited (compared to what is described in the manual) and the support features work poorly compared to Simplify3d. A status update would be helpful. I would gladly pay for an improved software toolchain - in fact I would pay for Simplfy3d if it was supported. 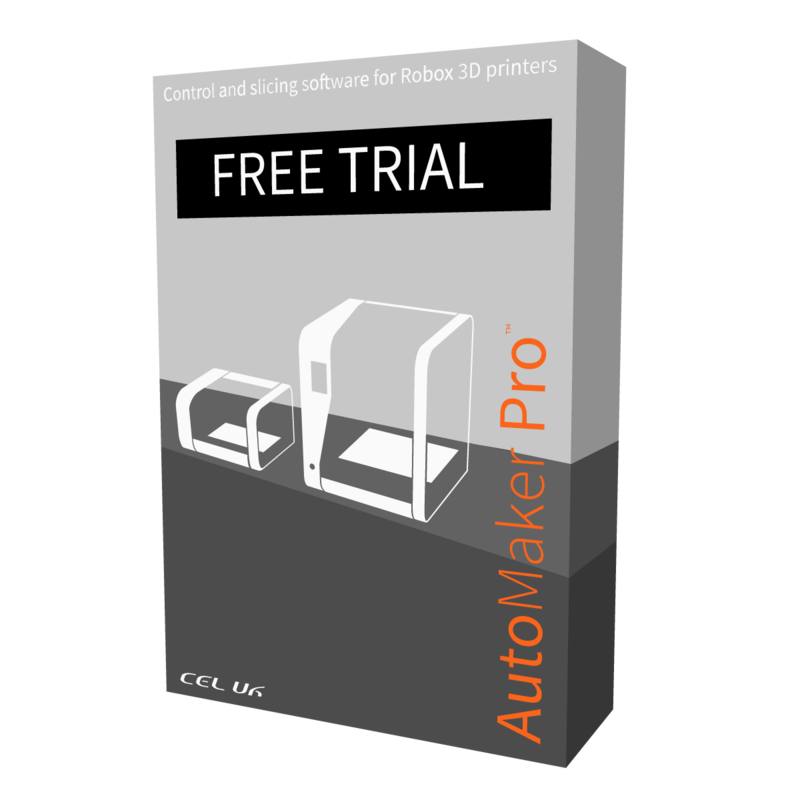 The RoboxPro is not a "professional" grade printer in the $5k price range compared to other systems we have used. We bought the RoboxPro and enclosure as an upgrade. A tool chain update with more extensive support capability, better infill options, better slicing, route optimization, and better interfaces between support and main body are needed. Also, it would be very helpful if you provided instructions for use of the dehumidify enclosure - I ended up printing my own interface brackets. If you want the STL let me know and I will email them. Hi Marcin, long time no see 🙂 I've just released Robox Printer, Extruder and mesh definitions for the Robox Dual 0.4mm, Quickfill and Single X on the Unofficial Facebook page.. Im just trying to figure out how to lock away some of the IPR in the post processing script,, but if it gets too hard then I'll just release it for free and maybe people will feel like giving me a donation for the efforts. Next job is to submit to CURA for full integration. IF you want a copy of the current files give me a shout on the facebook forum. Please how can I slice with AutoMaker WITHOUT running the printer? Sure hope the planned visualization tools planned for the next release help achieve this basic workflow convenience. Right now I hit Make, the printer groans, I hit Cancel after Slicing complete, then go grab the files from the PrintJob folder to preview on an online GCODE viewer. The reason I need this so badly is the AutoMaker v3.02.00 slicing process is producing some wild results which I'm trying to make sense of. Thin walls are sometimes sliced correctly in the "standard" 069830cde4e546a2.gcode but the 069830cde4e546a2_robox.gcode that gets sent to the printer fails to slice walls to 1 extrusionWidth thick. I've tried tweaking it by adding 0.01mm or other small values, but there is no apparent pattern to these failures. Latest Cura can handle it consistently fine, Slic3r too. Using a Kickstarter Edition Robox. I'm working with OpenSCAD and I want to be able to predictably make 1 line walls. There is a new feature in the upcoming release called Create Dummy Printer. This allows you to create prints without a printer attached, it includes several configurations so you can choose a head and material. The files can besaved for reprint later or use in the visualiser. @palindrom I have used Simplify 3D, but it's only "recommended" using a QuickFill head, but of course it will work with an Olsson ruby head with a little tweak. I wouldn't recommend it with a Dual Material head, as it doesn't work properly. They are working on a version 5, which will be a paid upgrade, but I've no idea if any post processing improvements or function additions will exist. As far as the latest Ultimaker Cura goes, this will work if post processed properly, and it's no different in principle to the "slicer mapping" that goes on in the existing Automaker post processing, except CEL omit functionality and group functions together to simplify things, but years later this is stagnating user choice. This complexity is the negative, as even Ultimaker, make mistakes with their own printers, and have to add corrections/bug fixes, with their expertise levels. However, the huge difference with their approach is the external community find these, and develop the software further, which gets arbitrated and included, and benefits all users and cuts out the development time. The positives, are the print quality is much improved, support structure is more developed, and gives real world benefits, the slicing visualisation is very good, (once configured), and the preview modes do capture small changes with tweaked settings. PS I don't go on Facebook much, but there are some good tweaks outside of this forum, that do make a Robox printer, quieter, reduce maintenance, and give better print quality. I don't find that infuriating, it should be an end goal. This community page and the content inside is publicly visible except in restricted groups. A registered community member is able to post content. Because of the open nature of this forum the content posted may not represent the views of CEL. While we do regularly read the content posted, in some cases the content may not be appropriate for the reader or may cause offence. Please help us by reporting such content. Technical advice provided in this forum may be provided with good intention and a belief that is is correct but may not be applicable to all hardware, software or user ability. In some cases content may not be relevant to newer or older revisions, conflicting or incorrect advice may be contained within conversations, community moderators will attempt to add to this or make corrections but to preserve the thread this may be on following pages or be missed as the forum evolves. For official advice users should contact the CEL support team via www.cel-robox.com/support/ and follow the provided advice to preserve safety, warranty and function of Robox hardware or software. This applies to any use or alteration which is not specifically described in the officially supplied guides from CEL. Community content should not be considered official even where posted by CEL employees. Only advice provided via the CEL support portal should be considered official. Robox is a complex machine with many potential uses, to help preserve the good working order of both hardware and software please be patient and note that many common fixes for other 3D printers do not apply to Robox and may cause irreversible damage or compromise safe operation.